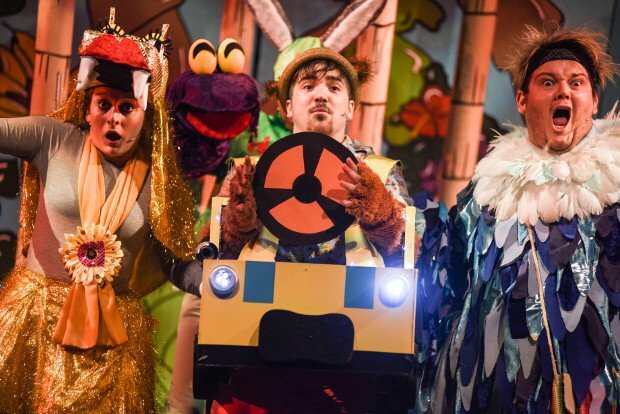 There are great songs and a pretty decent basic concept to AnimAlphabet the Musical – and Hit the Mark Theatre has a pretty talented bunch of singers with which to deliver it. On Treble Clef Island, the dreaded Dastardly Duck breaks free from his prison behind the treble clef, wreaks havoc between the Metro Gnome and the singing animals, then starts stealing all their notes. From Alligator's A to Frog's F, the animals could end up silent unless Cockatoo can save the day. There are a memorable bunch of tunes by Sam Swallow and Alan Sharland in different styles to reflect the animal's characters, so this could be a jolly introduction to basic music theory and genres of music. And in cast members Rebecca Ayres, Brad Clapson and Ishia Osborne the company has three very talented singers. Except that director and writer Mark Hooper has his head somewhere other than a show for children. His book is so peremptory as to be risible; his continuity so non-existent that even grown-ups will notice, let alone sharp-eyed youngsters. His kiss off, based on a theft, is morally obnoxious. There could be space in the hour to make this work, even if Hooper's direction was less dire, but he decides to give the songs such prominence you would think it was written as a vehicle for the singers' egos. And the songs, while strong, don't serve the plot. As for making the baddie a duck, that will always lead to floods of tiny tears. Self-aggrandising tosh. Pleasance Dome, until 28 Aug (not 21), 10.30am, £7.50–£10 (£6.50–£9). Hit the Mark Theatre present a tale of musical animals on a quest. I don't think this reviewer can have possibly seen the show that I took my grand-daughters to see. We all loved it. The show is well worth the 4 star reviews it's been getting from all other publications. I think the 1 star must surely be for Thom Dibdin's review which does NOT correctly hit the mark. Couldn't disagree more. Clearly reviewing this from the perspective of an adult with probably a few too many shows under his belt in one day. It connects emotionally, physically and in an aspirational way as children wonder what will happen. Dibdin clearly has no understanding of what Calando means or that the musical symbol represents a beak. Are the audience entertained... yes, do the critics have an ego... yes. Get kids to review kids shows. Simple solution. This is an interesting review. A lot of other comments/reviews I have seen have praised the show. Having taken my nephews (one is 3years and the other 6 months) they absolutely loved it. The eldest can't stop talking about and singing the show whilst the youngest grins when we sing it to him. Even my grandma, who is in her 70's, chuckled and laughed throughout the show. Whilst the reviewer is entitled to their own opinion I feel this review is more personal towards the director rather than a reflection of the production. Everyone is entitled to an opinion. Until this review the only opinions that I had seen or heard about Animalphabet had been that it is a 4 or 5 Star show. The first week reviews at Edinburgh for it were amazing. The reviews/opinions of the show and its performers leading up to Edinburgh, from locations around the UK, were unanimously and almost embarrassingly positive (I did wonder if cast members had paid the numerous media outlets). Of course Mr Dibdin, a seemingly credible critic, may have seen something EVERYONE else had not. OR he has a very particular taste in musical theatre aimed at younger members and their families, which was not catered for by Mark Hooper. An alternative suggestion for why Mr Dibdin took a very negative swipe at this show COULD just be that he wanted to stand out from the crowd... he didn't want to follow the masses of critics and audience members who have been standing in their ovation of this show. It is his very job to say something DIFFERENT, to gain attention, to make someone read his articles. Never mind if his (valid) opinion is contrary to ALL others. Now, my opinion of Animalphabet is that the performers are a talented bunch, the song lyrics are wonderfully written, executed by excellent singing voices, and the production, although pretty basic, is pitched perfectly at its target audience. Furthermore, my opinion of the review from @ThomDibdin is that is utter dross, written to garner attention, with very little truth. It is strange that this review is so at odds with all other reviews that I have read. The greatest critics are surely the very young audience that it is targeted at & it has been wonderful to hear how even very tiny children have been enraptured throughout. I wonder if Thom Dibden has actually witnessed any children in floods of tears at having a duck as a villain? Or is it more likely that they have left the theatre singing the songs & wanting the soundtrack? When I sat down with my Swiss roll and my weekly copy of the list, I quite honestly Dibden believe my eyes. The man must be quackers. He must be silenced... and I have just the device. Haha. I completely disagree with this ridiculous review. The show was everything that young children love. Easy to follow story, big characters, fun songs and dancing, great singers and lot of fun. My, almost 2 year old, daughter sat the whole way through it and I myself smiled the whole way through. I can not recommend this show enough. A very unnecessary swipe at a young Director and a production. Mr Dibdin has been contacted for a response to no avail. One wonders at the motivation to be so damning. We will however take our plaudits from the thousands of families who have seen and loved the show. Calando send his regards - QUACK! A bright and happy show, loved by my family. Catchy tunes, lovely costumes, great singers. All round a winner. Only an hour which is perfect for little ones. My two loved the duck! Couldn't disagree more with this review. I took my 12 year old daughter to see the show & we both loved it. Easy to follow plot, great cast, costumes & scenery. Brilliant catchy songs from across several musical genre's that were stuck in our heads for days after seeing the show & a baddie that you love to hate. The whole team both behind the scenes and front of stage should be applauded. Bravo! I think a lack of understanding of small children is lacking from this review. Small children don't pay attention to dialogue, complex plot lines or moral consequences. They pay attention to songs, music, lights and costumes; all of which were in perfect abundance in AnimAlphabet. Not sure what planet this reviewer is on but clearly got out of bed on the grumpy side! Couldn't disagree more with his assessment and would be surprised if he has any prior experience of reviewing children's entertainment. Animal Alphabet is an absolute joy! I took my 10yr old and 4yr old niece and they were totally enthralled! There was a mix of ages in the audience and the children were delighted as they were swept along in the story so cleverly put together with so much colour, enthusiasm and songs you will be sung for days. It was equally entertaining for us adults too with some wonderful humour to keep us chuckling all the way through. I would completely ignore this reviewer and if you have a chance pop along and see it, your kids will love it!